A guest contribution from Alex G. It features a band that I’m proud to say I caught playing live at the Glasgow Apollo when they opened for Roxy Music on the Flesh & Blood tour back in 1980.. This imaginary album Cooling The Medium is a selection from seven LPs, from The One With Echo Beach On It (Metro Music, 1979) to The Kind Of Folky One (Modern Lullaby, 1992). They did release a comeback album in 2010 but I never got into that, and besides, covering these seven albums in ten tracks was hard enough. 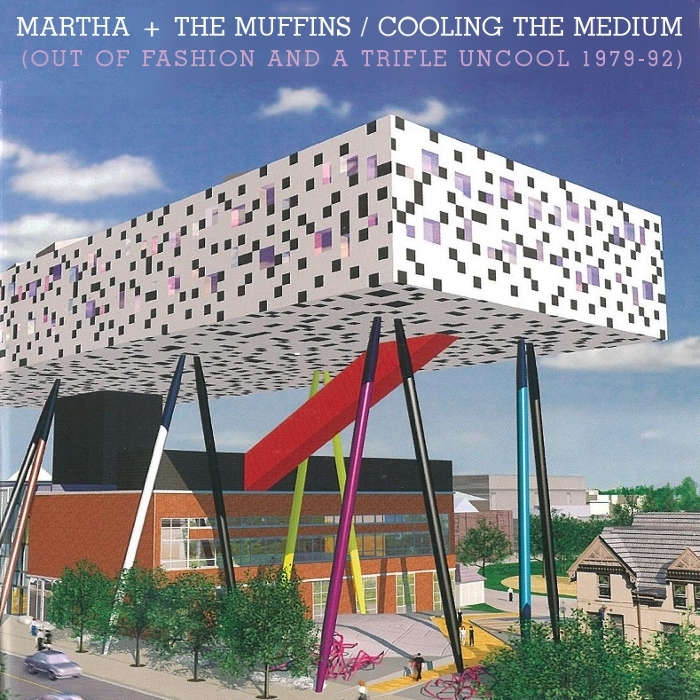 From the beginning, then… Martha and the Muffins formed in Toronto in 1977 and within a year had settled down to a line-up of Martha Johnson (vocals, keyboards), Mark Gane (guitar), Carl Finkle (bass), Andy Haas (sax), Martha Ladly (backing vocals, keyboards) and Tim Gane (drums). A self-financed 7”, Insect Love, brought them to the attention of Virgin Records, who signed them up to their new DinDisc label and brought them to the UK to cut a debut album Metro Music (Canada 1979, UK release 1980). The first single lifted from the LP was Echo Beach (side 2, track 3). I nearly didn’t put Echo Beach on this compilation. After all, you already know it, you’ve probably got it, and if you want to hear it, you can just hang around any supermarket with an in-store radio station and it’ll turn up soon enough. But it’s here anyway, for a couple of reasons. Firstly, because inevitably nothing else on “Metro Music” really comes close. I was going to use the follow-up single Saigon, but the write-up came down to “it’s pretty good, but it’s not Echo Beach”, so what’s a diligent compiler to do? More importantly, if we’re going to pretend that this could be a proper vinyl album, then let’s face it: there’s no way on Earth that you’d ever do a Martha And The Muffins compilation and NOT put Echo Beach on it. Apart from anything else, it’s just too damn good. So good, in fact, it was very nearly a career killer. Desperate to cash in, Virgin sent the Muffins on a lengthy promotional tour and then demanded a second album, pronto. Recorded in between live commitments, Trance and Dance (1980) was the typical rush-released follow-up and drew upon songs rejected from the first album, revisited B-sides and a cover of Chris Spedding‘s Motor Bikin’ which must surely be taken as a joke, albeit a somewhat inscrutable one. Barrel-scraping notwithstanding, I actually think “Trance and Dance” is a stronger album overall, and it’s represented here by two of its singles, both written by Ladly and appearing here in their re-recorded 7” forms. Lead single About Insomnia (side 1, track 2) features a lyric full of words like “viaduct”, “nonchalant” and “tableaux”, half a verse in French for no discernible reason, a saxophone solo to make your ears bleed (the one on the album version is comparatively well-mannered), and no chorus. Well, there’s something resembling a chorus but they only do it once so I’m not sure it counts. All surprisingly good fun and of course it made no impact whatsoever. Was Ezo (side 2, track 1) delves into Japanese history and revolves around the wonderfully rhyming fact that “Hokkaido / was Ezo”. You will be singing it! “Was Ezo” was Ladly’s finest moment with the group; shortly afterwards, she quit to pursue other ventures, including a spell working with Peter Saville Associates (the design on the front of the 1981-82 EP by New Order is hers). Finkle quit too, and fatefully, Jocelyne Lanois became the new bassist. With “Trance And Dance” failing to produce any hits, Virgin’s plan for making a return on their investment was to impose a name producer on the group, but the Muffins chose instead to retreat to Toronto and record with Jocelyne’s brother who owned a little studio there, to which the label responded by slashing their budget. You wouldn’t know it, though, because the then-unknown Daniel Lanois proved to be hot stuff, and the resulting album This Is The Ice Age (1981) doesn’t sound at all cheap – in fact it’s widely considered to be the Muffins’ magnum opus, and its opening track Swimming (side 1, track 1) is the opening track here. Representative of the more experimental, expansive sound of “Ice Age”, the Mark Gane-sung “Swimming” is undoubtedly one of their finest moments, and set the bar for a trilogy of albums with Lanois at the controls. The intro is supposed to sound like that, by the way. Fourth LP Danseparc (1983) was the end of the road for Martha and the Muffins as a full band. The “Ice Age” line-up remained largely in place (though Haas dropped out in acrimonious circumstances), but creatively the group was really now Martha Johnson, Mark Gane and Who Cares?. The album wore its transitional nature on its sleeve: shifting away from the new wave whimsy of “Martha and the Muffins”, Mark and Martha had settled on the minimalist moniker “M+M”, and put both the old and new names on the front cover. Showcasing Gane as both vocalist and guitarist, the angular funk of Several Styles Of Blonde Girls Dancing (side 2, track 5) is the album’s longest, grooviest and arguably funniest track (what the hell is going on at 1.58?). And it allows this compilation to start and end with Mark Gane vocals. Which is nice. The dancier Mystery Walk (1984, under the M+M name) completed the shift to a duo + session players format, and surprisingly enough actually seems to have had the reinvigorating effect Gane and Johnson hoped for, spawning an unexpectedly popular single in Black Stations / White Stations (side 1, track 5). This made it to number 2 on the US dance chart (a song lambasting radio stations for refusing to play black dance records was always going to be more popular in the clubs) and came tantalisingly close to a top 40 placing in the UK (it made #46), making it their second-biggest hit here, although obviously quite a lot smaller than you-know-what. It did somewhat kill its chances of being covered for years to come by making rather a big deal of the fact that “This is 1984!”. Alas, there was no room on this compilation for other great “Mystery Walk” tracks like the ethereal Garden In The Sky (which I initially pencilled in for the closing track) or the anthemic Rhythm Of Life (on which Lanois gets to deploy his stadium rock tricks), but Cooling The Medium (side 1, track 3), another pop-dance track with just a smidgen of “tribal” flavour, had to go on – if only because it provides the perfect title for the whole collection. And besides, I just really like this song, so there. With Lanois increasingly in demand elsewhere (his next project was U2‘s The Unforgettable Fire), “Mystery Walk” would be his last collaboration with M+M. The World Is A Ball (1985), largely produced in the UK by David Lord (previous credits: The Korgis, Peter Gabriel, XTC) was a disappointing collection with one spectacular standout, Song In My Head (side 2, track 4). In a world where “Echo Beach” didn’t exist, one could imagine this incredibly catchy pop song being the megahit they would never shake off instead. You’ll hate it, but you’ll have it in your head for the rest of the week. So there you have it, ten songs from seven albums by Martha and the Muffins, disparate enough for everybody to hate at least one. Ah well, at least it’s got Echo Beach on it. When this arrived in my inbox the other week I was really interested to download the songs and have a listen. As I said, I did see the band some 35(!!!!) years ago and remember them being a great live act who were afforded a superb reception from what was a notoriously difficult audience to please. The other thing that intrigued me was to listen to the Martha Ladly tracks as she, in addition to joining Peter Saville (and that was a new one to me as was the revelation that she was behind a New Order Cover), was to briefly be a member of Associates, a band that is much-loved round these parts and it is her keyboards and backing vocals that are such a major part of the hit single 18-Carat Love Affair. I’ve had the advantage of listening to the songs for a few days and I’m happy to say that this is a band that deserves a much wider recognition than they have generally been given. They are far too good and far too talented to be thought of merely as one-hit wonders….. Although the links to the songs have been removed by now, the original author Alex G (whose place is the esteemed We Will Have Salad) can help out. I would have included “Women Around The World At Work” – great track. Women Around The World At Work only just missed the cut, originally it was going to be the opening song. Thanks for this – I admit stopping at Echo Beach first time round, so I’m looking forward to exploring further! Was about to say the same thing — ‘Echo Beach’ was a huge club hit when it came out, but I can’t remember a single other song by the band. Looking forward to checking out the rest of the tunes! Love Echo Beach – it’s a New Wave Classic. But I also have much love for Black Stations White Stations. That was a track I remember hearing at Peppermint Lounge and Danceteria every Friday or Saturday night back then. There’s almost nothing better than Fractured Funk to get my feet moving!!! Guilty of only knowing Echo Beach. Really enjoyed your knowledge and writing. That’s what will get me to listen to these. Thanks for taking the time. Thanks – a real education! I obviously knew Echo Beach and vaguely recall Saigon. I do have the 7″ of Black Stations / White Stations as well (as it got played a lot on a local pirate station). Can’t think why I never looked further into the band and hearing these tracks, I wish I had done. Martha Ladly is now an Associate Professor at Ontario College of Art and Design. I would have to say that she would be my favourite Muffin for sure. Her first solo outing “Finlandia” turned my head, but then she joined forces with Billy and Alan’s Associates to play a violin. Wow! Oh yeah… this Dutch TV appearance is my favourite. Don’t know why… it just is. Why weren’t the rest of the 1980’s like this? There is another very cool couple of clips of the group doing “Skipping” and “White Car In Germany” on this very show… Gotterdammerung 2000. I was tidying things up and removing links that went way back. I’ve a plan in mind to get all the ICAs back up but it’ll be time consuming. Tasty looking comp and a very good write-up on a band I always thought a lot of… amd very nice job on the cover art too!